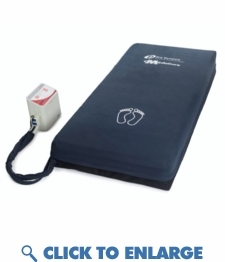 The pro true low air loss mattress is optimal for a hospital, nursing home or long term care setting. The blower low air pump generates a powerful 1800 liters of air per minute, 40% greater than most low air mattresses. The pump easily converts to a bariatric mode with a push of a patient. The bariatric setting generates more airflow through the mattress catering to larger heaver patients. The constant true low air loss therapy creates a cool microclimate that drys and heals pressure sores effectively. Pro dynamic low air therapy gives the patient a sensation of "floating on air" offsetting painful pressure points to the body. The pro bariatric gives the patient an extremely comfortable support surface and the flexibility to customize the therapy. 5 Distinct comfort zones balance the mattress based on the patients weight for maximum comfort and patient immersion.